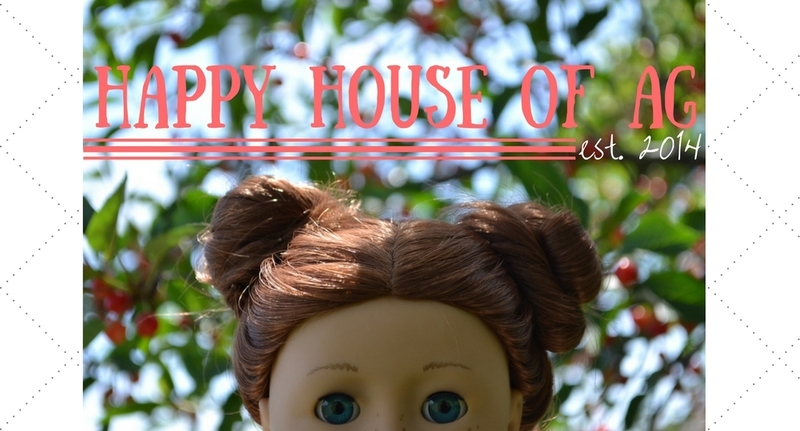 I’ve put together a review of American Girl doll Truly Me #24! Let’s get started, shall we? Truly Me#24 has the classic face mold, line eyebrows, brown pinwheel eyes, and the standard freckle pattern. She had blonde hair that goes down to her elbows. It curls quite nicely, but the hair in the back of the wig doesn’t hold the curls as well as the front. I have been told by several readers who own #24 that if you brush her hair with the normal American Girl hairbrush, her curls will straighten out and won’t curl again. 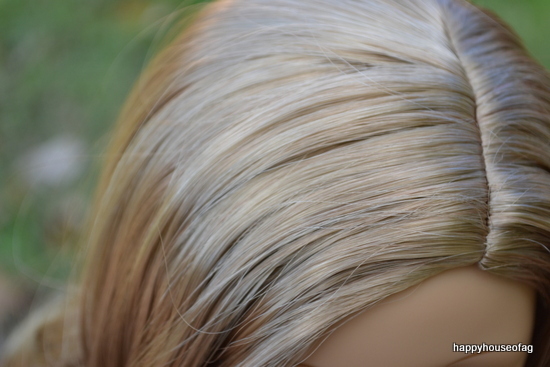 If you buy this doll, make sure to get American Girl’s Sparkly Hair Pick, too! Her hair is parted on her left, and while it is blonde, it is an entirely different shade from Caroline Abbott’s. Caroline, who is shown in the photo above, has much lighter hair than #24. #24’s hair is more on the dirty blonde side. It’s quite easy to take care of; a girl of eight or nine could probably manage her hair just fine with American Girl’s Sparkly Hair Pick. Next, I’ll review her outfit! She comes in the standard Truly Me uniform: a lilac dress and and blue shoes. 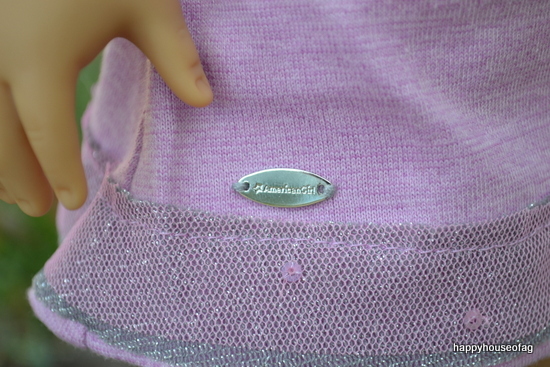 On the bottom of the dress is a metal tag that says “American Girl.” It seems that AG has started putting metal tags on all of their Truly Me clothing instead of the old fabric ones. At the top of the dress, a pinker shade of lilac tulle goes all the way around the neckline. A few sequins are sewn onto the tulle. Near the left sleeve are three stars of varying sizes, embroidered in blue. The sleeves themselves are 2/3 length. 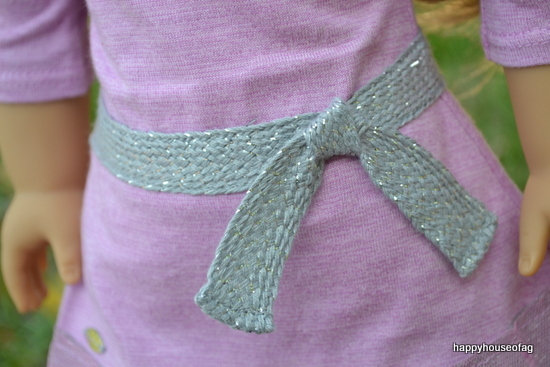 Around the waist of the dress in an attached gray belt. 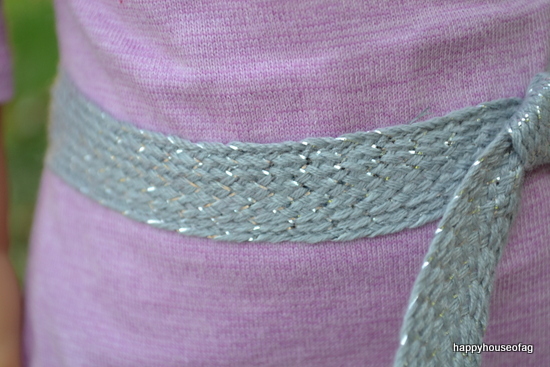 There are sparkly silver threads mixed into the belt’s weave. At the bottom of the dress are two layers of tulle: the bottom one gray, the other lilac, with sequins. The dress goes down to just above her knees — a little short, if you ask me, but I think it’s still pretty cute. Her shoes are simple blue flats with sparkly silver dots on the toe. They are very easy to get on and off. She comes with pink/lilac underwear with white trim. I give the doll itself five stars — I don’t have a single complaint! She has such a sweet face and gorgeous, silky blonde hair. The dress, on the other hand, gets a four, as it’s a bit lacking. It’s well-made, but the colors don’t all come together. If you are considering buying Truly Me #24, I hope this helped you make up your mind! P.S. I’ve been getting a lot of comments asking when the next part of the TSO will be posted. Guys, I’m really sorry I haven’t posted that yet. I’m going to take the pictures soon. Cute! I just love the new meet outfit. It isn’t made with tons of details, but this is just a starter outfit. The meet outfit is pretty cute, but it’s just not my favorite of the ones that they’ve made. The JLY one is my favorite. Which one do you prefer: JLY, MAG, or TM? That’s probably my second favorite. She is so adorable!!! You are one lucky duck! How do you say her name? Oh my gosh, I can’t like- ugh. I need her LOL! Thank you! I am always relived when I realize that it isn’t just my doll that has a problem. Do you think the wig is too thick in the back, or what? Thanks! She is really cute. :) Do you think it’s the freckles that make her stand out? I didn’t like her the first time I saw her, either — the way American Girl styled her hair in their pictures really put me off. I love the review. Her hair is so pretty and I think her dress is perfect! 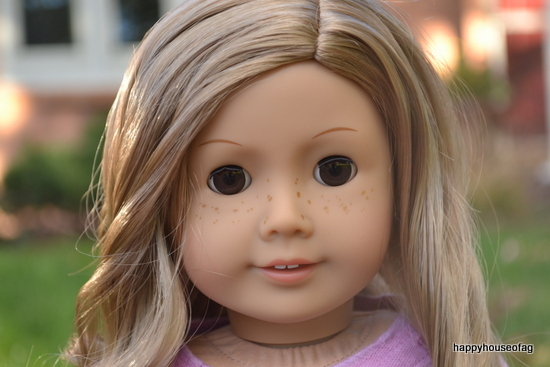 I really want a truly me doll. 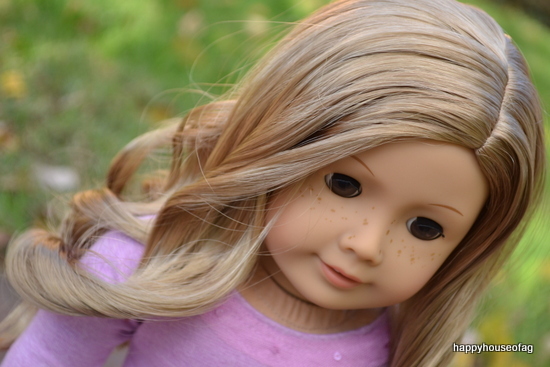 I don’t have an AG doll and I would LOVE one! I’m really into dolls right now. I’m hoping to get another OG doll soon! The pictures were great! Thanks! I hope you get an American Girl doll someday soon. Question- how do you use the sparkly hair pick? 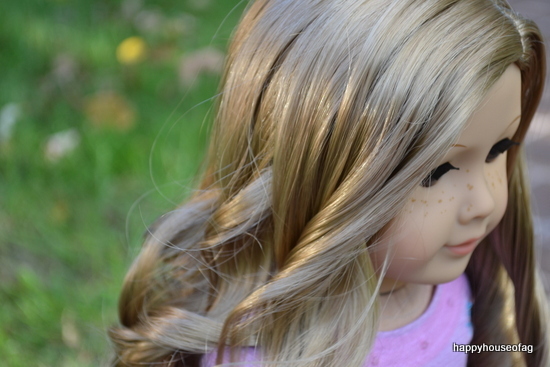 You use it to brush the doll’s curls without taking the curl out. So, you brush one curl at a time, brushing in the direction that the curl is twisting. She is stunning. Thanks for the review.